According to Mike Garafolo and Ian Rapoport, the San Francisco 49ers have acquired Detroit Lions guard Laken Tomlinson in exchange for a 2019 fifth-round pick. Tomlinson was the Lions’ 2015 first-round pick. Tomlinson was effectively benched last season in favor of then rookie Graham Glasgow but found himself back into the lineup due to injuries along the offensive line. He played 728 snaps for Detroit last season. 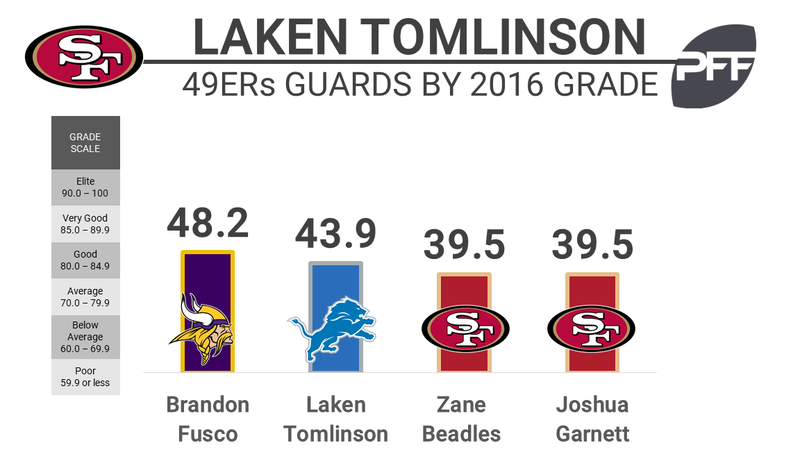 Tomlinson’s play has yet to live up to expectations, grading poorly in each of his first two seasons. As a rookie in 2015, he earned an overall grade of 49.1 which ranked 53rd among guards and this past season he earned a 43.9 overall grade which ranked 64th out of 75 qualifiers. Tomlinson’s woes have mostly been highlighted in the run game. His 2016 run-block grade of 38.4 ranked 70th out of 75 qualifiers. This preseason Tomlinson has not fared much better earning an overall grade of 59.1 on 59 total snaps between two games.